Vladimir (Roushie: Владимир) is a ceety an the admeenistrative center o Vladimir Oblast, Roushie, locatit on the Klyazma River, 200 kilometers (120 mi) tae the east o Moscow alang the M7 motorwa. Population: 345,373 (2010 Census); 315,954 (2002 Census); 349,702 (1989 Census). Vladimir wis ane o the medieval caipitals o Roushie, an twa of its cathedrals are a Warld Heritage Steid. It is servit bi the Semyazino Airport, an durin the Cauld War Vladimir wis host tae Dobrynskoye air base. 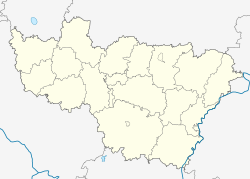 Vladimir is the admeenistrative centre o the oblast. Athin the framewirk o admeenistrative diveesions, it is, thegither wi seiventeen landwart localities, incorporatit as the Ceety o Vladimir—an admeenistrative unit wi the status equal tae that o the destricts. As a municipal diveesion, the Ceety o Vladimir is incorporatit as Vladimir Urban Okrug. Vladimir is hame tae several electrical an chemical factories, several fuid processin plants an twa lairge thermal pouer stations. Tourism relatit tae the historical steids is a major contributor tae the ceety economy. The heidquairters o the 27t Gairds Rocket Airmy o the Strategic Missile Troops is locatit in the ceety. Durin the Cauld War, Vladimir wis host tae the Dobrynskoye air force base. Syne 1861, thare haes been a railwey connection atween Vladimir an Moscow. Vladimir is linkit tae Moscow an Nizhny Novgorod bi the M7 heich-gate. Local transport includes buses, trolleybuses, fixed-route minivans, an taxis. Vladimir bus service links the ceety tae aw the destrict centres o Vladimir Oblast, as well as Moscow, Ivanovo, Kostroma, Nizhny Novgorod, Ryazan, Yaroslavl an ither ceeties. Vladimir daily throu the station passes o at least 20 pairs o lang-distance trains, year-roond direct rail links Vladimir is linkit tae Moscow (Kursk Station), St. Petersburg an Nizhny Novgorod. Syne the simmer o 2010 Vladimir associatit wi Nizhny Novgorod an Moscow direct flichts heich-speed train "Peregrine Falcon". Developit suburban rail. Vladimir wis the anerly ceety in Roushie involvin commuter trains at ance wi twa Roushie ceeties wi subwey. If you go bi train frae Vladimir, the nearest station in Moscow - "Novokosino", Nizhny Novgorod -"Moscow." In November 2012 Vladimir train - Nizhny Novgorod wis canceled. The ceety is servit bi the Semyazino Airport 5 km wast o the ceety centre. Vladimir experiences a humid continental climate (Köppen climate classification Dfb) wi lang, cauld winters an short, wairm simmers. The magnificent five-domit Assumption Cathedral wis designed as a sepulcher o grand princes an dedicatit tae the holy icon Theotokos o Vladimir, which haed been brocht tae the ceety bi Andrew the Pious. The cathedral wis constructit in 1158–1160, expandit in 1185–1189, an pentit bi the great Andrei Rublev an Daniil Chyorny in 1408. In 1810, a lofty bell-touer wis addit in Neoclessical style. The warrior-like cathedral o St. Demetrius wis built in 1194–1197 as a private chapel o Vsevolod the Big Nest in the courtyard o his palace an wis consecratit tae his holy patron, St. Demetrius. For aw its formal unity, the cathedral represents an internaitional project o Roushie an Byzantine maisters, Friedrich Barbarossa's masons, an carvers sent bi Queen Tamar o Georgie. The Gowden Gate, oreeginally a touer ower the ceety's main gate, wis built in 1158–1164. The gate acquired its present form efter haein been reconstructit in the late 18t century, tae prevent the dilapidatit structur frae tumblin doun. Ither remarkable monuments o pre-Mongol Roushie airchitectur are scattered in the vicinity. For mair information on thaim, see Suzdal, Yuriev-Polsky, Bogolyubovo, an Kideksha. Vladimir is hame tae the Federal Centre for Animal Halth an Welfare an aw. The ceety association fitbaa team, FC Torpedo Vladimir, currently plays in the Roushie Naitional Fitbaa League]], haein entered the seicond level o Roushie profeesional fitbaa efter seiventeen years o competin in Roushie Seicont Diveesion an Roushie Third League. Vladimir VC (previously kent as Skat an Dinamo Vladimir) represents the ceety in Volleybaw Major League B – Zone Europe. Vladimir is hame tae Polaris-Vladimir ice hockey club an aw, which competes in regional hockey competitions an Roushie minor leagues, an baith male an female Luch table-tennis teams. ↑ "World Weather Information Service – Vladimir". United Nations. Retrieved 1 January 2011. Законодательное Собрание Владимирской области. Закон №130-ОЗ от 10 декабря 2001 г. «Об административно-территориальном устройстве Владимирской области и о порядке его изменения», в ред. Закона №156-ОЗ от 12 декабря 2012 г. «О внесении изменений в Закон Владимирской области "Об административно-территориальном устройстве Владимирской области и о порядке его изменения"». Вступил в силу со дня официального опубликования (13 декабря 2001 г.). Опубликован: "Владимирские ведомости", №232, 13 декабря 2001 г. (Legislative Assembly of Vladimir Oblast. Law #130-OZ of December 10, 2001 On the Administrative-Territorial Structure of Vladimir Oblast and on Procedures for Its Change, as amended by the Law #156-OZ of December 12, 2012 On Amending the Law of Vladimir Oblast "On the Administrative-Territorial Structure of Vladimir Oblast and on Procedures for Its Change". Effective as of the day of the official publication (December 13, 2001).). Craft Brumfield, William (2004). A History of Russian Architecture. Seattle: University of Washington Press. ISBN 978-0-295-98394-3. This page wis last eeditit on 8 Mairch 2018, at 05:46.